Planning your wedding day is filled with everything from the really important decisions like which venue to have your reception at down to the smaller decisions like should Aunt Jenny really be at a table that close to the open bar. I get it, it’s really hard to figure it all out and sometimes it can even be a tad confusing. One of the decisions I see my couples going back and forth with the most often is whether or not to have a first look on their wedding day. There are a number of reasons for and against this wedding day trend, so let’s jump right into helping you decide what works best for you. With all of the controlled chaos of a wedding day, sometimes it can really be hard for the couple to get a few moments alone. Everyone means well and they just want to congratulate you and wish you well. Unfortunately, after an entire day of that, you can walk away exhausted and feeling like there wasn’t enough time for the both of you to just be together on what was supposed to be your day. A first look can give you those precious moments together - just the two of you to be yourselves (OK, the two of you and your photographer but that’s just nitpicking now isn’t it? Ok, and maybe the video company... but you get the point. Let's move on.). I always try to suggest to my couples that they schedule some time in the day just for them. Whether it’s during the first look, their portrait session, or even a little time before their entrance into the reception, it’s great to be able to regroup and enjoy each other’s company away from everyone else if only for a moment. You’ve waiting all this time for your wedding day, the ceremony is over and now you want to get to your reception and have fun with the rest of your guests. But wait, we still need to take those pesky family group shots and your portraits as well. It’s not uncommon to see the bride and groom start to get a little anxious to get to the reception and just want to be done with the portraits because they are just tired from all the anticipation of the wedding itself. The problem is that your portraits together can be some of the most important to you down the road and if you aren’t enjoying yourself then you’ll see it in your expressions and the moments won’t be as honest. You don’t want to rush through photos that important. A first look can work to your advantage because it’s taking place much earlier in your day where you are fresher and still looking your best right out of hair and makeup. 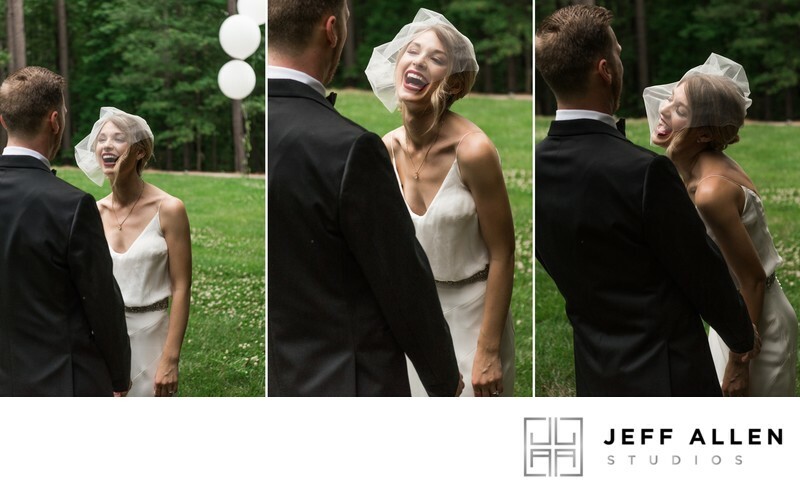 There’s a strong chance you have seen one of the humorous/horrifying images on social media of a wedding ceremony where the scene is ruined because one of the guests at the ceremony had decided that the best way to remember the very touching moment taking place right before them is by holding up their iPad at eye level to take photos or video instead of simply being there. In doing this they end up obstructing the view of other guests as well as the photographer more often than not which can be very problematic. There is always that chance that as the couple sees each other for the first time the photographer’s view could be obstructed in that precious moment leaving it lost forever. With a first look we can eliminate the potential of that because your photographer and their team are the only ones there and will know how to stay out of each other's way to capture each and every moment. One of my personal favorite moments of the wedding day is that moment when the couple see each other from opposite ends of the aisle. This is also a favorite for many family members as well as your guests so by having a first look you deny them that often-emotional exchange. Sure, you may still get a little choked up when you see each other if you’ve had a first look earlier in the day, but my experiences have been that it’s much more subdued than when there hasn't been a first look. 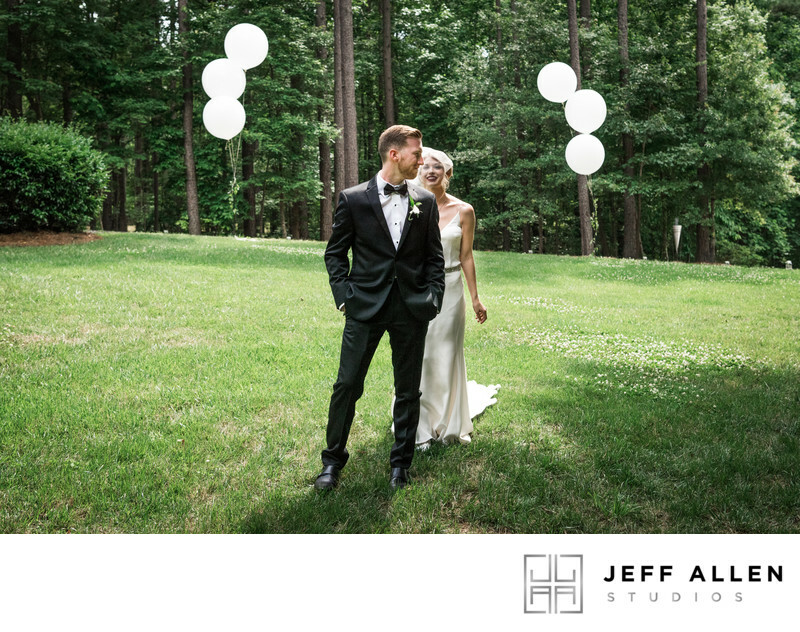 Many times, I get requests for first looks to take place in open fields or at parks because of their scenic quality. Visually tht can be stunning however you then run the risk of getting the train of a dress and your shoes dirty prior to walking down the aisle. You’ve spent quite a bit of money on your wedding attire so it’s a shame to take them outside and get them filthy before the ceremony. Sure, we can also do the first look inside but often that isn’t as romantic to the couple and not as appealing visually. As a side note, being a wedding photographer here in North Carolina, besides getting your clothing dirty, you risk starting to sweat possibly staining your clothing or worse causing your hair and makeup to start to come undone before the ceremony. You also risk your bouquet starting to wilt if you decide to incorporate it as well. Is the Moment Even Real? Many couples decide to have a first look because they’ve heard about them from friends or have seen photographs online and in bridal magazines. Because they fall in love with the idea of the first look, that can sometimes create certain expectations they feel they need to reach in how they react. You are aware you are being photographed and know exactly what’s about to happen which can cause a less than genuine reaction when it actually takes place. Instead of the moment just taking place you can find yourself caught up in thinking about your expression and how it will photograph instead of having an honest emotional moment. You’ve now not only created a fake moment but have stolen some of the impact from the actual first look during the ceremony as I explained previously. So now that I’ve gone through a few of the reasons for having a first look as well as some of the potential pitfalls of having one, should you have one or not? What’s the correct answer? That’s just it, there isn’t one. In the end, it’s your day there is no right answer that is going to apply to every couple and their particular nuptials. I am always happy to capture a wedding day however the couple’s heart desires so it will come down to their personal preference. As I’ve already shown by example, there simply isn’t a right or wrong answer when it comes to the first look. While they have started to fall off slightly in popularity in recent years, I still get requests to capture them all the time, so it comes down to what works best for you as a couple. In the end, that’s really all that matters anyway right? This article has been featured on Bustld! If you are looking for a Raleigh wedding photographer and you'd like to have me capture your wedding day, please Contact Me for more information. I would love the opportunity to be there for those amazing memories being made!